Most entertaining! It has a kind of Lewis Carroll lunacy to it which I really liked: felt as if I might bump into a Jabberwocky, a Mock Turtle or the Cheshire Cat at any moment! Nice one! Thanks… that old poem came to mind when I read your line. Interesting way of using the prompts,way to go Ted. Thanks, Ranu… how’s things in St. John’s? Cold and the grounds are covered with snow,thank you for asking. Man, I wish I had thought of that! I will have to consult you on the next one, Betty. Maybe that’s the only way I can get you to write a story. I don’t always recognize a one-word response when I answer the phone. I think Cheryl knows it will be Ethel before she picks up the phone, Maxi. Thanks. I really feel like people are just nailing their stories this week and this is one of my favorites of yours that I’ve read. It’s clever and funny, with clear dialogue and some great lines- my favorite, at least the one that made me laugh out loud, was the suggestion that the hares should be ambushing baby chicks like some bunny mafia. Great read, I loved it. These two crack me up. Nice to see you back, Ted! I love your use of the prompt. I’m thinking the egg dying could go in a really disturbing direction! Lovely job with this. Whoever heard of a dark easter, Indeed! I loved this! Hahaha! Man, I love those two. And I can think of at least one guy who had a dark Easter. Great use of the prompts, Ted! Love the animated absurdist feel to their dialogue. Funny! And I love the drawing. 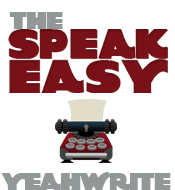 I have never much explored the Speakeasy side of yeah write, but this was hilarious and made me curious to dig deeper. Are you the real creator of, “The Far Side?” Loved it. This is HILARIOUS, Ted! Love the conversation. Thanks for bringing it to the party! Have fun trolling! Enjoyed this story so much! Clear narrative with bags of personality. Thanks for making me smile!